What you share on your social media accounts really does matter. Be aware of all of the key functionalities that each individual social media platform offers, and learn how to use them effectively. When setting up a Facebook page for your business, for example, research and analyze how internationally successful brands are creatively putting the spaces for their profile and cover photos into use. 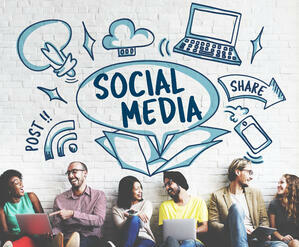 Have a consistent color palette and typography throughout your company’s social media pages. If you can, work with a graphic designer to refine the overall brand identity and the visual elements related to your brand. If you are not able to afford a professional graphic designer or photographer just yet, you can still make your social media accounts look more professional and gain much more traction by paying closer attention to how you photograph your products, listed houses or work space. Using a professional camera and taking photographs from the right angle with correct lighting makes a huge difference. However, it is okay even if all you have for documenting your business is a smartphone. You can still manage to share much more effective photographs by using some of the free photo editing tools or apps (such as Snapseed and VSCO) for color correction and proper cropping. If you crop your photos at a 4:5 ratio, for instance, you will end up occupying the maximum amount of space available for a single post on Instagram. As a result, your followers spends a little bit more time being exposed to your post while scrolling down their feed, increasing their chances of liking or commenting on your post. Social media channels are treated in a way similar to the magazine subscription services of the previous century. You need to construct and maintain a powerful social media presence, and keep your followers engaged through interesting posts, which you need to share regularly. Businesses that use their social media channels effectively usually come up with a plan towards the end of every month for all the posts they will be sharing the following month. Your goal should be to turn your social media channels into broadcasts that your followers should feel the urge to come to every day for either useful information or just some fun. Have a consistent style. Many businesses regularly post useful articles related to their industry, while some simply use humor (such as Wendy’s) to remain popular on the leading social media platforms. A smart way of keeping your users engaged and informed about your business at the same time is sharing important facts about your brand. Make sure to post about the current updates regarding your business (such as a new house listing or a seasonal discount), as well as the events your company attends and the articles your company gets featured in. In addition to the 3D renders, illustrations and/or screenshots you have related to your business, sharing real-life documentation of what you are selling generates familiarity between your followers and your business. This will help you define your customer segment and turn your followers into customers in the long run. Have people interact with your products and document them in the process. Make photo/video documentation of every event your company attends. Document and archive everything you can; some of your media documentation might seem redundant now, but will come in handy in the future. Using hashtags effectively is very important for boosting your social media presence. It is essential for you to choose the right keywords that define your business clearly in order to reach your desired target audience. Using popular hashtags is usually considered a safe way of reaching out to the maximum number of people, but finding more specific hashtags, such as keywords used by blogs, brands and magazines that mainly focus on your company’s industry will bring you followers that have a better chance of turning into customers in the future. Interacting with your followers is also a good way of keeping them engaged. Ask questions, propose discussion topics, initiate dialogues and always reply to your followers’ comments on your social media pages in order to gain more traction and to repetitively lure your followers back to your platform on a regular basis. Asli Caglar is a freelance Social Media Manager, Instanbul-based Photographer and Visual Artist, and Founder of Our Big Fat Planet. To see more from Asli, visit her portfolio here.